Please LIKE Burning Lamp Media & Publishing Facebook page. Click here to order this new release. David Oh has done an outstanding job removing the sometimes mystical undertone to the prophetic and presenting it in a very clear, concise and easy to follow layout. This book is filled with solid sound biblical teaching as well as real life examples on the practical application of prophesy. It is with great pleasure that I recommend Beginning in the Prophetic for everyone who has a desire to hear God’s voice and partner with Him in calling forth His purposes into existence. I highly recommend reading Beginning in the Prophetic as a great how-to manual for hearing God. David answers many questions that we all have as we begin listening to the voice of God and steers us in the right direction as we journey deeper into the prophetic. It is rare to find an author who is able to introduce a multi-faceted subject in a brief, concise, and thoroughly readable manner without sacrificing clarity or skimping on the essentials. David Oh has produced delightful evidence of just this kind of skill and gifting in the pages of Beginning in the Prophetic. 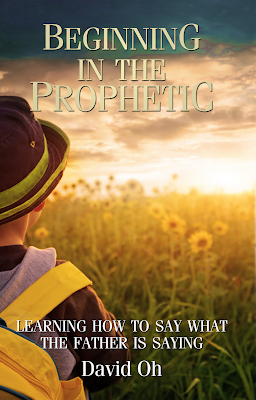 I heartily recommend this prophetic primer, not only to those taking their first steps in prophetic ministry, but also to seasoned prophets who are often called upon to help de-mystify this gift for the equipping and encouragement of the saints. Allow David to “open the door” to the vast treasure room of prophetic ministry and you’ll find your appetite whet for more of God’s communication to and through his children.